Could it be true? So I sadly can't seem to access Twitter's search tool but I did do some browsing online and found it on the Gossip Rocks Forum too. I think it might be true. YAY. Wow. Still in shock. This is truly awesome. 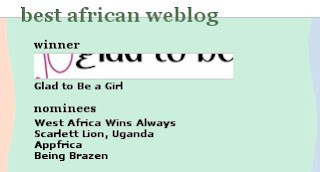 And yeah, I know, I'm not really the best African Blogger, or even the best South African Blogger, but hell yeah, I'll take what I can get :) Welcome to all the new readers who'll be hitting my site for the first time after this award, you're why the win (and even just being a finalist) is important. Exposure. That's what it's all about ... the awards I mean, not why I blog in general. So, back to normal programming. Yesterday was ye olde typical Monday. Damn now I sorta wish I'd stayed awake and online to watch the awards be announced, or hell if only I coulda convinced myself & everyone else it was a viable excuse for a trip to Texas - tee hee! A girl can dream ;) Varen was home late, around 8pm. Just in time for a delish dinner of My Mom's Macaroni Cheese. It's the first time I've made this (it was one of my favourites back home) and I spent a large portion of the preparation time on the phone with her. Let's just say that the recipe she emailed me left a lot to be desired. It was little more than merely a list of ingredients. Oh sorry, did you think that would include quantities. You'd be mistaken. My mom's been cooking for years, she just adlibs, she has no idea how much of anything she uses and it still turns out perfect. Not ideal for a girl like me, but I was determined to learn this dish. So we battled thru making a roux for cheese sauce all the while on speaker phone. It get's pretty amusing when you're trying to figure out if you're making enough and a squash ball becomes a unit of measure. Then as I reminded my mom, I've never really played squash (okay once, but that was very long ago). And she explained that a squash ball is half way between a tennis ball and nothing. But, I will say that it turned out perfectly. Secretly I think I may have made a better cheese sauce than her ;) I am definitely looking forward to the leftovers for lunch! CONGRATS on winning a bloggie! It surely got our attention - we just had to check out your blog! Congrats from the Phuthu.co.za team. Let's hear your thank you speech. Do you get a prize? A statue of a computer, perhaps? woohoo, congrats! What a great feeling! Now please can I have your mum's mac 'n cheese recipe! GOD, that's FANTASTIC. ell done Phillygirl - it couldn't have happened to a nicer blog. Congrats!! I'm so thrilled for you! That mac & cheese sounds very interesting - when do we get to see some photos of all these yummy things you whip up master chef? @brazen - thanks :) And well done to you too on being one of the few finalists!! @louisa - I know, I know ... I am beginning to think I shoulda just posted the good recipes the first time I made them. Now I'm on such a role I only want to make new things I haven't tried before. I'm sure eventually I'll get round to re-making the favourites tho :) And then I promise to post them!